An assortment of peppers grown at the Dania Beach urban garden. Click the play button above and listen to this segment from WLRN's hour-long episode, "The Sunshine Economy: The Grocery Business," with host Tom Hudson. The episode is part of an ongoing series examining key industries of the South Florida economy. Shows air Mondays at 9:00 a.m. on 91.3 FM. 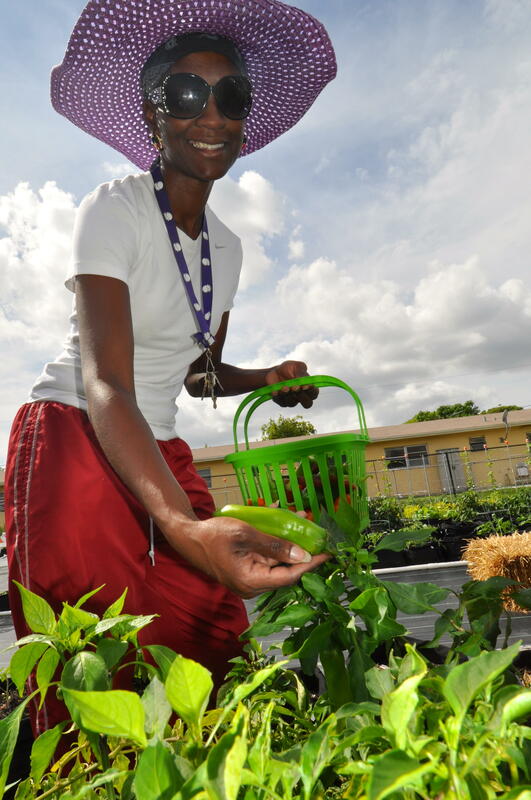 Rachelle Lawson picks jalapeños from the urban garden project in Dania Beach. Leon Carroll has lived in this food environment his entire life. He's retired now and volunteers at the garden. Before kale, mustard greens and collard greens sprouted from bags on the plot of land, Carroll found most of his fresh veggies from his own personal garden. While he still tends to his own garden, he spends plenty of time tending to the peppers, radishes and pole beans of the community’s urban garden. Rachelle Lawson also lives in the area and serves as the urban garden’s manager. In addition to her duties, she enjoys the fact that the urban garden has brought together residents who no longer have to travel to neighboring areas to purchase fresh food. There's also a public health component to this effort. Deaths from diabetes are 25 percent higher within the community compared to the rest of Broward County. This is why Olivieri consider access to fresh food as public infrastructure, similar to clean water and good roads.